It is highly probable that the ability to distinguish between living and nonliving objects was already well developed in early prehuman animals. Cognizance of the difference between these two classes of objects, long a part of human knowledge, led naturally to the division of science into two categories: physics and chemistry on the one hand and biology on the other. 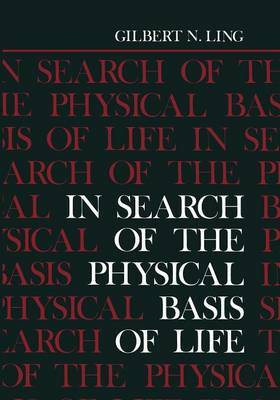 So deep was this belief in the separateness of physics and biology that, as late as the early nineteenth century, many biologists still believed in vitalism, according to which living phenomena fall outside the confines of the laws of physics. It was not until the middle of the nineteenth century that Carl Ludwig, Hermann von Helmholz, Emil DuBois-Reymond, and Ernst von Briicke inaugurated a physicochem- ical approach to physiology in which it was recognized clearly that one set of laws must govern the properties and behavior of all matter, living and nonliving . . The task of a biologist is like trying to solve a gigantic multidimensional crossword fill in the right physical concepts at the right places. The biologist depends on puzzle: to the maturation of the science of physics much as the crossword solver depends on a large and correct vocabulary. The solver of crossword puzzles needs not just a good vocabulary but a special vocabulary. Words like inee and oke are vitally useful to him but are not part of the vocabulary of an English professor.